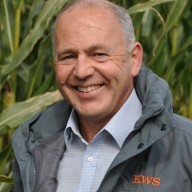 Research has shown that each maize variety contains differing levels of by-pass starch, with the percentage content in early varieties significantly higher, compared with their later counterparts, as John Burgess from plant breeder, KWS, explains. The growing demand for high starch levels in maize destined for the clamp has been fuelled by producers seeking to partially replace expensive bought-in concentrates with high quality forage. This trend has not gone unnoticed by plant breeders, says Mr Burgess. “As breeders, we have responded to market demands, by focusing on maize quality and selecting for high starch, especially in the early FAO 150 – 170 hybrids,” says Mr Burgess. “Producers are also seeking early-maturing varieties, to allow more time for establishing the following crop and to help them comply with environmental regulations. “Our efforts have been largely successful; the average starch content of our early maize varieties was 33-34% five years ago and will have risen to 35-38% for 2017. These are trials figures and farm-scale crops will usually score 2 or 3 points lower, although some of the ultra-early varieties are nudging 40%. “A proportion of the starch in a maize kernel can be described as being vitreous or ‘glass-like.’ This quality makes it more difficult to break down in the rumen and a high energy-dense forage can lead to the rumen becoming overloaded with the material, increasing the risk of acidosis. It is why many nutritionists set a limit of 25% starch inclusion for a total mixed ration. “However, maize kernels also contain a proportion of by-pass starch, which is a less vitreous material and performs exactly as its name suggests, by-passing the rumen to be digested in the abomasum. This produces more readily available energy for the cow to utilise and comes with a lower risk of potential health issues. “Producers are also seeking early-maturing varieties to help them comply with environmental regulations, so attaining higher bypass starch results in a double benefit from early hybrids. “Each variety typically has a different level of by-pass starch, with some early hybrid maize varieties containing twice as much by-pass starch as later varieties. This information offers a useful tool for producers when they are selecting varieties to suit their systems and to match the other ingredients in the ration. “In Germany and Denmark, figures for by-pass starch content are beginning to be analysed and published for all varieties, and there are plans to introduce the system in the Netherlands. The value is expressed either as grammes per kilogramme, or as a by-pass ‘fraction,’ in gms/kilo dry matter. Although by-pass starch values are not currently published on the in UK maize descriptive list tables, they may be introduced at some point in the future. “Milk production is becoming increasingly sophisticated, with advances in technology and pressure on prices. This has led to dairy farmers having a more detailed approach to ration formulation and maize is just one of the ingredients which has come under the spotlight. “We are already pushing the limit of maize silage inclusion into the ration, because of the risk of acidosis. If we can manipulate systems to include a higher level of by-pass starch, there is the potential to improve milk from forage. But decisions also have to take into account the economics of growing the crop and the effect on yield. “Another element which offers a possible opportunity for cost savings is to increase consistency within the clamp. Nutritionists often encounter problems with ration formulation, because of inconsistencies. “One way in which to level out quality is to grow just a single variety, but this approach will not suit every farming system. Another solution is to pay close attention to crop maturity and ensure that maize is cut at the correct time. However this is not always easy to achieve, in practical terms, due to the weather and the demands placed on contractors. By-pass starch has also been found to correlate with the crop’s maturity status, so timeliness will also have an influence on this element of the ration. “We have also seen that a modest reduction in seed rates will give a clear boost in starch content – farmers stepping down from 42,000 seeds/acre to around 38 – 40,000 have observed this already in 2016, especially where they habitually grow early hybrids,” says Mr Burgess. Mr Burgess recommends growers to opt for a chop length of about 25mm for this year’s maize silage harvest. “Chopping at 12-15mm may lead to greater efficiency at harvest, but the practice will reduce the material’s ‘scratch factor,’ which is a term not widely used nowadays but which still holds true, when it comes to rumen health,” he says.